I have not the first idea what it feels like to have my every move and my every fashion choice scrutinized, so it is with some hesitation that I critique First Lady Michelle Obama’s choice of the wisteria print Tracy Feith dress she has worn repeatedly since the 2009 inauguration. However, I feel my critique of our gorgeous First Lady serves a greater purpose of educating my audience on proper style and color choice. 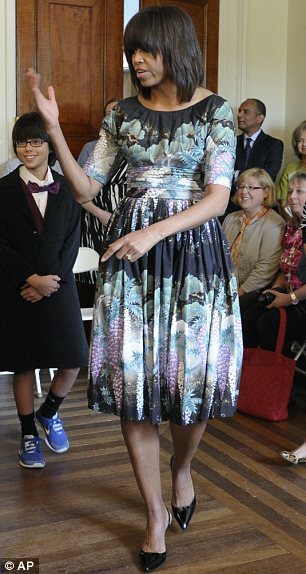 When I saw a photo of Mrs. Obama wearing this dress at an appearance in May of this year at Willow Springs Elementary School in Fairfax, Virginia, it was the first time I have laid eyes on it, and I was aghast. Let’s begin with the style of the dress starting with the sleeve length. What many find most amazing about Mrs. Obama’s physique are her incredibly shaped arms. While I do not propose that one go around exposing her guns at every opportunity, I do think a better choice for her is either a cap sleeve, just longer than cap sleeve, a full length or a 3/4 length sleeve. This half sleeve length is awkward. It is neither short-sleeved nor long, and it completely covers her famed upper arms. If you are going to completely cover her arms, go with a longer sleeve. Otherwise, I would have suggested she cut the sleeve length a good 4 – 5 inches. Only women with bad upper arms need wear this length. Further, I find the gathered neckline of the dress, the pleated sash and the full, pleated skirt to be a bit junior for her and much too many pleats overall. The sash fits well and it gives her a small waist; however, the full skirt in this swishy fabric creates too much volume around her hips. Please do not get me started on this wisteria print. I realize prints are very personal choices, so it’s hard to criticize her, but since she is a very modern lady, this literal print seems to clash with that part of her. Finally, the colors in this dress are ghastly on her. A woman with her coloring needs brighter, more true, saturated tones. She should not go within 20 yards of a gray or anything gray-toned. The combination of the grayish green, grayish purple, soft black and off-white are so blah, blah, blah on her, and she’s so not blah, blah, blah. As a comparison, I want you to see our First Lady in a sleeveless red pleated dress. What a difference! As you can see, it is a much more modern take on a pleated dress in a much more flattering color and shape for her. Don’t you agree? So, with all due respect to Tracy Feith (wherever he is) and to Mrs. Obama, I hope this is the last time she wears the wisteria print dress. She has much better options in her closet starting with this gorgeous red number. If Mrs. Obama favors a literal print, I suggest she do it in smaller doses. How about a wildly colored floral print high heel pump with the red dress next time? That I would love to see!